Found Fish #2302. Very excited to see it. Took it and will replace in a new CT spot within the week! I had a thought that somebody launched it into the water in a fit of frustration. Yes, very true my friend, I didn't think of that! Thanks for checking for me. It would have been awesome if you would have found it but no matter, I have a replacement ready to go. Just as "fun" too he, he, he. Found in RJ100. My first Mumufish!!! Picked up while doing maintenance on my Riz Americain cache. Fish 2305 is now in Cache GC37NPX (visit link) near Bregenz, Austria. Picked up at Peter Pan in Graham Hills Park. Will bring this little Mumu fish with us out west us and will drop him in a cache in the next few weeks. Retrieved from GC3H8YF. I'm going to see if this little guy wants to go for a road trip to the ADKs next week. Dropped off in (visit link) in Lake George Village. Picked up at the spanking tree at Lake George. I dropped it off in Belmont, NH at GC3CHKB 'I don't care' (visit link). I can't remember where I picked this one up, but it could have Milford. I'll drop it in another pond soon. Found on the Manhan Rail Trail in Southampton, MA. Will be moving it along to Misquamicut Beach in the morning (close to the ocean). The little fish made it the ocean! Dropped at Misquamicut Beach, Westely, RI! It will continue its swin in old saybrook ct tomorrow. I forgot to log this at the time, but I dropped this one off in Thanks, MadMin after the Berkshire Mega Geobash. 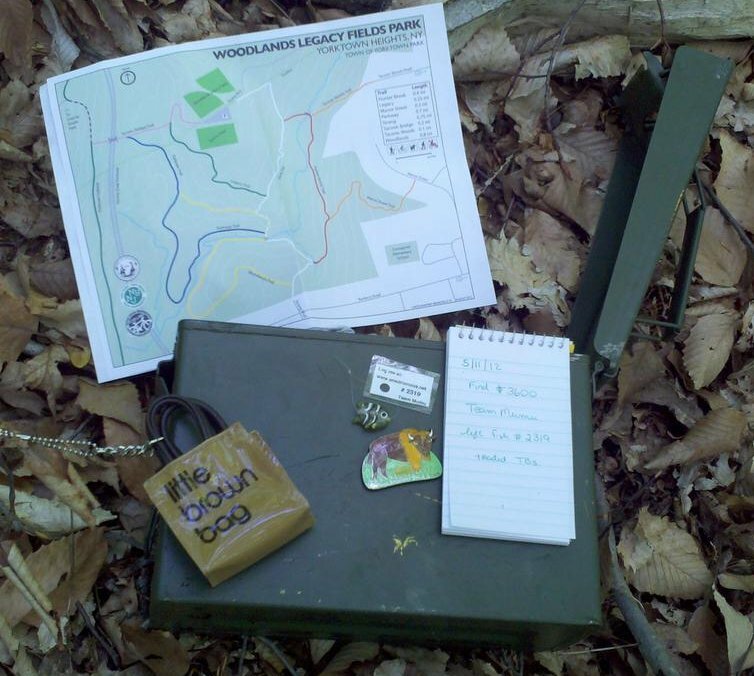 Picked up from geocache GC3J0C8 (visit link) in Lenox MA, will move along. I found the cache but didnt see the MuMu fish. I found the cache but didnt see any MuMu fish. Grabbed this today at the final stop of my Yorktown caching roundup. I hope this fish likes the cold. I have a feeling he'll be heading to the great white north pretty soon. Found at Bush's Trail Run #47. Picked this up in (visit link) GC3JGH2 . Not sure what I'm going to do with it yet, but I love the idea behind these things! Found this and 3 other fish in the Vug in the Rug (visit link) today. Found this fish on July 24, 2012 in I Ain't Afraid of No Ghost. Will move along soon. I picked this up in Rev Your Engine. Found this in Cedar Scrub in NY. Will take him swimming somewhere else soon. I honestly don't remember where I picked this up. Today when looking through my caching bag I found the fish. Seeing how this was originally dropped off in Ancient History, perhaps that was where I picked it up? Rescued this little fellow from Dingle Berry. Planning to take him for a bike ride on Thursday. Had planned to take this little guy on an Ulster County bike ride today, but plans changed. Took him to another state instead. He know rests in Park Pond GC12W63 (visit link) in Connecticut. Picked this one up while caching through teatown.. Thanks! Retrieved from Teatown - Trailways series #6. Will move further north. Found on my 1st first to find - Easy as Pizza. Made some friends along the way. I retrieved #2334 from "Cache of the Day" 10 Year Anniversary Cache this afternoon. I am taking this little fishy with me next week out to the desert of Las Vegas, Nevada to celebrate the 4th of July! I hope she survives out there in the hot and dry desert because I am leaving her there. Thanks for the find! Congratulations on 10 years of caching! Took this li'l fishy along after finding "Cache of The Day". We'll swim together to another cache soon! Dropped this li'l Mumu Fish in the "Peace, Love & Geocache" cache at the site of the Woodstock Festival in Bethel, NY, on the 43rd anniversary of Woodstock. She'll swim peacefully there. Thanks for the fun fish bead! What do I do with it? Found this gorgeous fish at Fisher Meadows Rec Area(Avon, CT). Can't wait to drop it in a new place! My second Team Mumu fish! How very exciting! Dropped it off at the 12-12-12 Multi Event on LI, so that the Mumu fish can migrate. Saw this little guy at the 12-12-12 Event, Long Island, NY. Found in Marjorie Post Park in Massapequa. So cute! Will move along soon! Found in Dinosaur cache, a nice surprise and an interesting way to mark your milestones. Thanks for sharing. very cool travel item, will move along shortly. found 5/3/2012 on long island. i do not remember the cache i retrieved it from. Found on Long Island. The little guy asked to swim upstate. Who am I to say no? Left this little fishy at the World Heritage Geirangerfjord as we walked up to one of the viewpoints. Left this in Alesund (visit link) during our visit. Found this little guy in Alesund while visiting from Cincinnati. Will move this guy across the "Pond". Took this from Bergen and currently residing in Oslo. We'll drop it soon around the city! I found this little fish at the Botanical Garden in Oslo. Maybe we travel together to Germany?? Will leave Norway for sure. Found this one near Zeitz (Sachsen-Anhalt / Germany) in GC1M8DE (visit link) "Herausforderung! II - Unter Strom". Fun finding this at the border with the kids, when leaving Finland. Will be brought to Tromso, Norway. Left this at the World Heritage site of Tanum in Sweden. Took from Tanum World Heritage. Great rock carvings. Will try to find another interesting location for this fish. Picked up at Teatown -- one of our favorite hikes! Will trade him for another soon...the girls promised!!! Found today at Boulder Top (Topstone Park)with the cache in very good shape. Retrieved and moved to Hallow Gravely Tour cache. TFTC! Retrieved from California Hilltop #3 on 10/17/2014. Another fishy we picked up that you placed on my birthday! Love these little fishys, will take it along the trail and find it a new place to swim. Thanks for sharing. You placed this token in this cache on my Birthday! 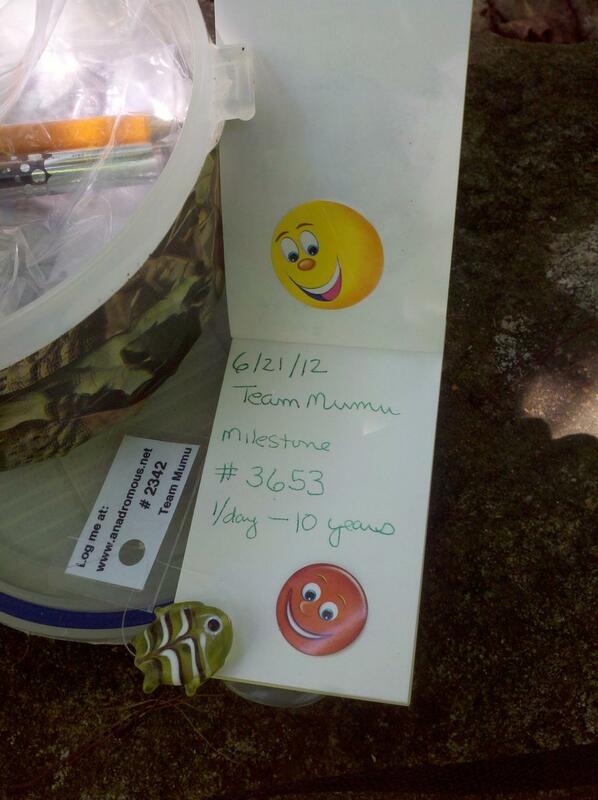 I picked it up from the Connetquot River Park Cache on my quest to finish the Caching Like It's 2001 Challenge. Enjoy reading your travels. Found it at "South Trail" not far from where it was released. Enjoy the fish theme! Picked this up after a five year plus dry spell for the cache. Will pass it on - appropriately! Found this one in Meyer Preserve will move him along. Grabbed this from its original location on 6/6/14. Picked up for further geocache adventures. Will log once again when dropped off. We found this in a camo thermos on the New Hampshire Vermont border, in a town very close to Canada. Our plan is to relocate it to another cashe in our area or close by because we are a caching family with two toddlers. Took it from Chappaqua, will move it out west in a month or so. I didn't see this little fishy while checking on the original cache. Picked this fish up this past Saturday in the Blue Mountain/Peekskill area (in The Sportsman cache, perhaps). Will move along. Held on to this fish for too long but was able to release it near its tropical friends in Bermuda at GC1TCN1. Going for a visit in California in 2 weeks!! Picked up fish #2397 and will relocate it somewhat closer to its native habitat! This fish was smiling when I dropped it off a short swim from the Atlantic Ocean at GC2PYXR - TRC Cache to Eagle #10 at Jones Beach State Park. Be careful though, I saw lots of fishermen. Swam into this one today at the Pinecliff Sanctuary (in the "Trails and Tribulations" cache). I left it there for someone else, though, because it's such a peaceful spot. Grabbed this from Trails and Tribulations in Pinecliff Sanctuary while rehiding traveling geocache "Town & Country" within the sanctuary. I learned about these cute little fish when I first started caching (can't remember how) and was thrilled to finally have one in my hand! In a 6 degrees of separation, Team Mumu just found out first geocache Wyndygoul today and left a fish in there! Safely secure in my caching backpack to hibernate until relocation. This little fishy has swum on to other waters.